Hello friends! I'm participating in today's Hero Arts blog hop! I'm sharing two cards using the new July My Monthly Hero kit. The kit features a gorgeous ocean theme, with boatloads of jellyfish, octopus, sea turtles, coral, etc. HA! Seriously, it is a huge set. As usual, once the kit sells out, it is gone. I'm predicting a sell out. UPDATE: THE KIT SOLD OUT and a winner has been selected. NOTE: Hero Arts will donate 10% of profits from sales of the July 2016 kit to the World Wildlife Foundation for ocean preservation. Sweet. Made this card with the add on stamp set, Color Layering Octopus. Apparently, octopus** are trendy. Who knew? I stamped the solid octopus over the embossed layer, using Kuretake Clean Color markers on Strathmore Bristol paper. I learned from Kristina Werner that you can get a great image stamping with these markers if you condition the stamp with Ranger Black Archival ink (then clean the stamp!). It worked perfectly! A little watercoloring over the image and on the panel, a little gold shimmer, black speckles, yada yada, and it was done. For my second card, I just wanted to make a pretty pattern. So, I used a bunch of small images from both sets, using every acrylic block I own, and carefully stamped out a pattern. The tiny fish are great for filling in gaps. Clean and fresh. Here's a list of the designers participating in the blog hop. Hero Arts will select one comment from all the blogs to win the kit. Good luck! ** There's a dispute over the proper word for more than one octopus. I'm sticking with octopus. MOOD WHEN DONE = Good. Now, it's time to clean up the craft room! LOve that fishy blue background you made! Both cards are GREAT Joan...especially like the Octopus! 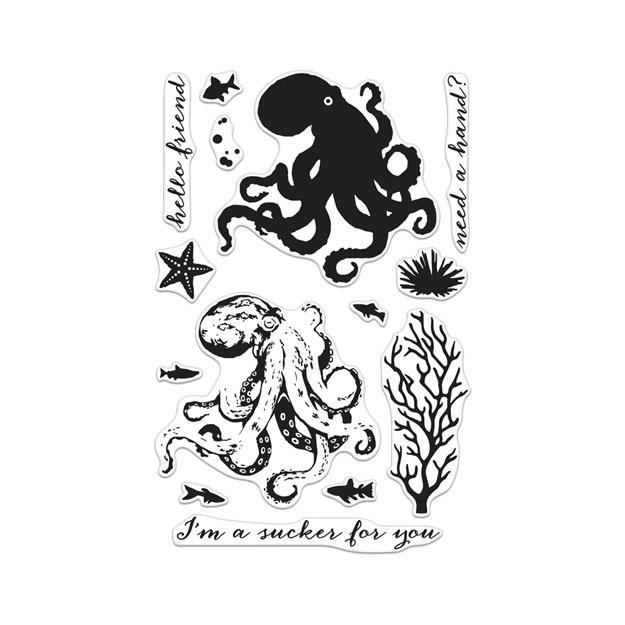 The kit is GORGEOUS….and the add on octopus is WONDERFUL!!! All going on my wish list!!! your cards are so different but so beautiful!! love how you used all the little stamps to build a background! I love how you got two completely different looks. Both cards are fabulous! your cards are great, I love the pattern stamping! Both are lovely. I really enjoy the second with the little stamps. So cute. 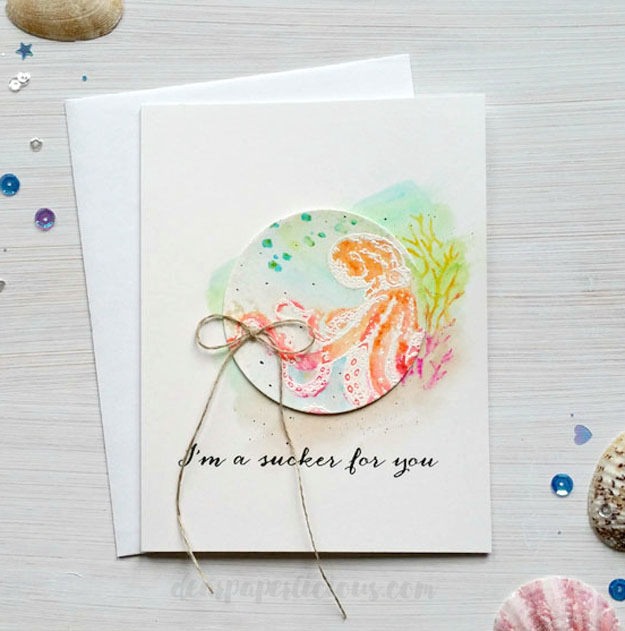 Great sentiment on your top card, love that color combo, so peaceful and beachy feeling! Beautiful background you've created on the bottom card! Enjoyed both of your catds, but especially liked all the images for the background. Absolutely love your choice of colors for that trendy octopus...and, of course, the sentiment is hilarious. And the background you made with this little images is fantastic. Love the bright blue background of little images! and thanks for the tip about stamping with Clear Color markers - will have to try that. Just before I came to the blog hop, I ordered my MMHK plus the seahorse set. I live by the sea, so I love everything ocean-related. Great cards! I love both. I like the blue background (love the blue colour) but the first with the octopus is super fantastic. Great! Wonderful cards - both so different, but great techniques on each. Thanks. Clever use of all the different small images to create the background!!! Great examples of how versatile this kit is! It's a beautiful look at this set of stamps. Beautiful cards! fabulous cards! love the allover background design. Beautiful cards. Love this kit. Beautiful cards! And octopi or octopuses. either would be correct lol. I like the look of the embossing on card 1. I do believe its octopi? I love the colours on your card. I love how you did the octopus but I really love the second card. It is so simple yet so beautiful! It would definitely make someone’s day! But you could definitely make a ton of those to have on hand. It would be great. I like the blue card the best, the colors and using all the little sea creatures to make a background. Thanks for sharing! I really like both of the cards you made! Awesome card!!! Really love the octopus card!!! Great cards. I like the embossing technique used for the octopus and the pattern of using all the little stamps. Both cards are simply lovely! I especially love the patterned paper. very nice. I really, really like your card layouts. Wonderful! Wonderful use of all those little stamps. Good thinking! Just lovely cards. I love your Octopus scene. 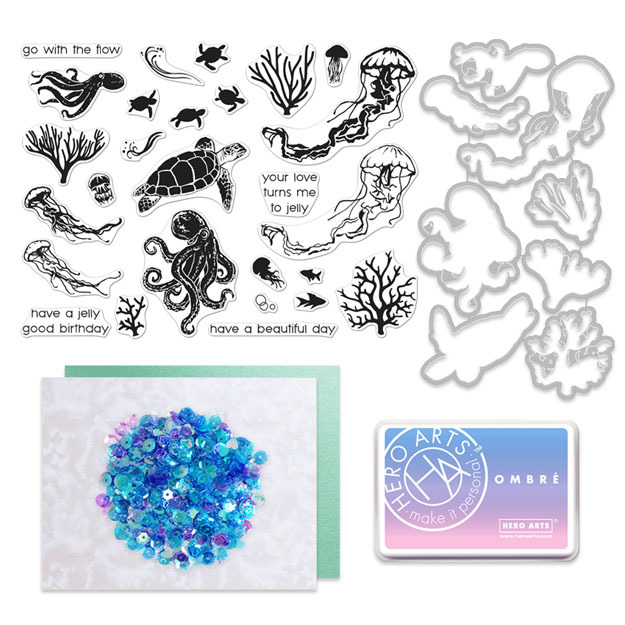 Beautiful Ocean stamps and dies from Hero Arts. Really pretty cards!!! Thanks for sharing them! Both cards are great but I love the way you spotlighted the octopus. Your two creations are beautiful. I'm always admirative to watercolor work. Wow, I love both cards, it always amazes me how talented everyone is. Such a great use of the stamps for the background. What a wonderful kit. Love both of your cards. The texture on the octopus adds great visual interest & the blue pattern sea creatures is stunning! Sooo beautiful! Amazing texture on that octopus! I really love the octopus in the circle and the rest of the items outside the circle. Your coloring is gorgeous and I love the white on the Color Layering Octopus "add-on". The second card is something I never seem to remember. Using the smaller items stamped as a background, and what a pretty background it has. Super job. Love the octopus. What a great kit! Your cards are both fabulous and so beautifully made! A great kit and is terrific that HA is donating to the foundation. Fantastic background you made! I really enjoyed browsing on your blog .... you are too funny! I really like the texture you created on card #1. It is absolutely beautiful. Beautiful colors! Love your card and the new release. Oh, I love how you used the July card kit. Awesome card. Amazing cards! Love the ocean background on the second card. Love the blue card. So different from your other one. Very creative. Funny, I was just thinking that who knew an octopus could look so wonderful on a card. I like it with the white embossing and the swirly pattern of the tentacles almost seem to add movement to the image. Great job and TFS! Like how the octopus is moving in the coral. Love both of your cards---what a great kit!!!! This is such a fabulous kit. Super cute cards. tfs! Both of your cards are so nice. I always loved seeing and watching an octopus when I was diving. It is amazing to see how they move and how small a space they can squeeze into. I love that these stamps bring back great memories. I think making your own background with all the little stamps was a great idea, great job!Thank you for sharing! Super cute and fun cards Joan. Love the heat embossed octopus with the bright colors... great underwater scene. The second card looks great with those tiny images. The blue and white card is stunning and the octopus card is amazing! Wow! This has been a great blog hop! Your card is so pretty. I love the colors you chose. I just love how each one of these is so creative and unique. Such an awesome kit. Would love to win. Thanks for the inspiration. Very nice cards, love the blue on white, just stunning! Both beautiful cards, but I especially love the octopus one! Great cards, love the circle in the fist one gives another focus in the card. Your cards are both gorgeous but I love how you've stamped your own patterned paper on your second card with the tiny stamps - brilliant! 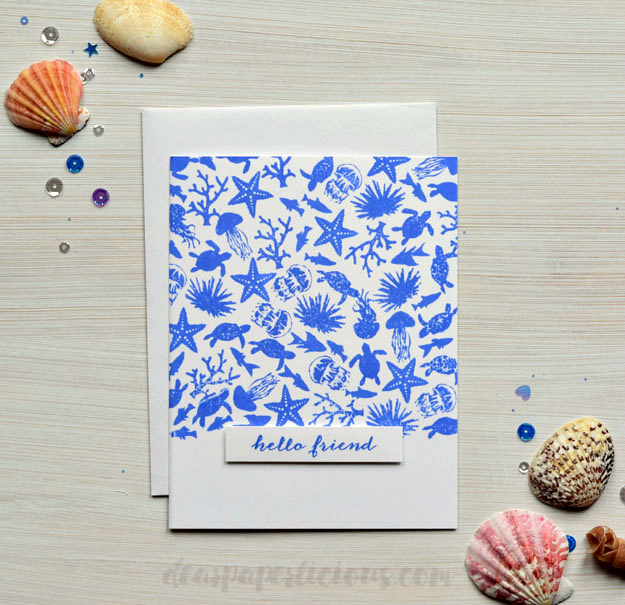 Both are gorgeous cards,move the watercolored octopus and the blue on white stamped background! GREAT cards! Awesome new kit from Hero Arts! Awesome cards. I like your clean and fresh card. Great card. The kit is fabulous. both cards are lovely! I have to admit the 2nd card is my favorite! I really like the look of the bright background in contrast to the white card! Beautiful! Awesome cards! Love the first one with its pretty color combo and textures! Fun sentiment too! Wow! Two totally different cards. I love the way your put some of the coral outside the circle on the first card. I love that awesome bright blue on the second card! Great background! You don't care for octopi? 😜 these are both fabulous- this kit was already calling to me- but seeing your beautiful creation with the layered octopus has me thinking it's calling me too! Wow!! I never think of octopi as beautiful, but your version is magical! These are both just gorgeous designs. I had no idea octopi were trendy either but I'm happy to go along with it if they're are lovely as yours! Your blue card is beautiful too! Love the first card you made! Beautiful cards and a fun inspiration ! Beautiful projects!! Love the shimmer you added to your first card. Joan, you rocked the kit...love these both! Your cards are wonderful. Thanks for sharing. Great cards and oh so fun! Wonderful card designs with this new kit. This kit is absolutely GORGEOUS!!! So many possibilities! And your cards are stunning, thanks for the inspiration!!!! I love your first card is perfect and the best card in this hop, so awesome!!!! These are just lovely! I especially like the spotlight octopus! Love how you created the focal image on the circle and continued the scene beyond the circle. The colors are amazing, too. And your background card really makes perfect use of the smaller images. Beautifully done! Really neat technique and beautiful outcome. Cant wait to try this. beautiful cards... the first one is so soft and pretty! This is such a great kit - and supporting a great cause! 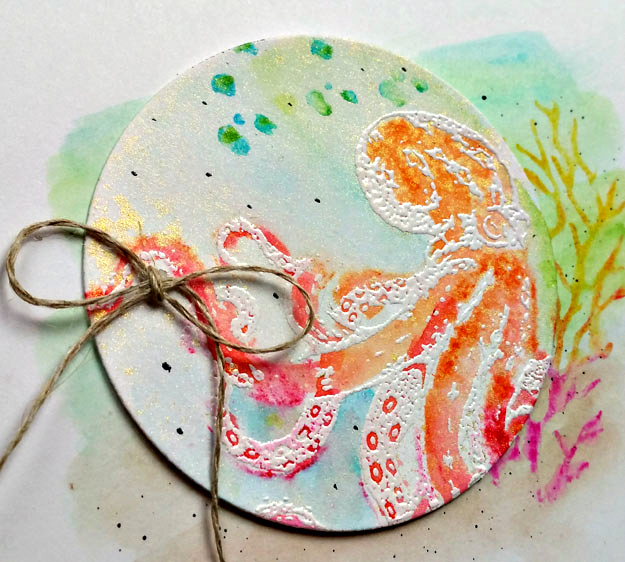 Love the embossed octopus and the watercoloring. So pretty, Joan! Love the blue - so bright and vibrant. Your card design is wonderful and the technique you used with white embossing a layer of the octopus was great. A pretty card. What a unique card! I love the embossing technique used! Joan, BOTH cards are fabulous! I love the soft colors and seaside feel of the octopus card, and the blue one reminds me of delft china, but in a seaside motif. Just lovely! Great release and beautiful cards. I like both cards, however, the last one is so different. Thanks for sharing. I just finished a book about octopuses and this is the correct plural. It was for a book club at the library and they are fantastic creatures. Love seeing all the cards. I do like the blue and white and how nautical it looks. Your cards are very unique. I really like them. Love the watercoloring and the embossing. I love your two cards, so different but very great both ! The colors on the first one are tremendous and the pattern you gave on the second is terrific ! Can't wait for my kit ! Thanks a lot for sharing and for the inspiration. Your first card is different but I really like and the other one is great too. Two great cards - What an awesome neon octopus! Thanks for showing allof the small stamps in such a smart fashion! Stunning cards! Love the white embossing on the octopus! Love your layered technique for your background!! Just gorgeous!! I love your designs. They are so unique and different. It's a sign of a very talented artist. Love your card design. Beautiful! The background you created is super cool. This monthly kit is just wonderful!! Love everything in it!! These are both fantastic. It's great to see only the smaller stamps used for that pattern. I always forget to give that a try. Love your first card and the second one looks so symetrical I thought it was pattern paper! Great job. Great cards, Joan. Thanks so much for sharing with us AND for participating in this great hop and giveaway. Love the kit and your cards! So pretty! What a cool look with that white embossing! But I have to say, my favorite is the pattern you made in that lovely shade of blue! Lovely cards Joan! I'm so ready for those jellies, but they're all sold out. I hope they'll be back in stock. Both cards are beautiful. I love the texture on the octopus and that background u made is fabulous! Love the octopus card & the blue & white one is stunning! Love the design for that ne. I love both cards and you are the only one who embossed anything. Great job! Nice cards! Nice coloring on the octopus and I like how you used all the little stamps and made a great looking pattern. Omg your cards are just stunningly beautiful... love them. Love these cards, especially the background made with the smaller images. Great job! Love the kit and add on. Thanks for sharing. Love them both, Joan! I was really taking in the water color, then I saw the blue card and my heart leapt at all of that blue and white space. LOL. Blue is my favorite color. Great kit. Both cards are awesome, Joan. Love how you showcased two totally different looks from this kit. Great job! WOW!! I just love how you created your cards, they are so different and creative! Love the artsy look of your first card and the fun pattern on your second one. Both cards are fantastic! I love the octopus on the first, and the background on your second! Beautiful cards! Love the spotlight circle. I think I already missed the giveaway :( but i wanted to say it's a really lovely card.